Just lately I have really been enjoying creating meals where the veggies are the stars on the plate and not the meat. This meal was a super delicious and nutritious creation, that even went down extremely well with my meat loving man. It filled us up and above all tasted soooo good. In fact after sitting here writing the recipe up this afternoon, I am going to cook it for dinner this evening because my mouth is watering. When I shared it on my social media pages, you guys went crazy messaging me for the recipe, so here it is…….da da!!! enjoy! – Place carrots and chickpeas on a baking tray. Drizzle over the coconut oil and sprinkle with cumin. Cook in the oven for 20 mins or until chickpeas are crispy. – Coat the cauliflower steaks in the tandoori spice. Heat a large based non stick frying pan on a medium heat. Melt the coconut oil. Lay the cauliflower steaks in the pan. After 5 mins or when the cauliflower has turned golden brown, flip over and cook the other side also for 5 mins. When both sides have a lovely golden colour, pop on a tray and into the oven for *5 mins to cook through. *cooking time will be dependant on how thick your cauliflower steaks are cut. Try to avoid over cooking them, otherwise they will go soggy! give them a poke with a fork during cooking to test their firmness. – Mix the tahini paste and yogurt together until smooth and runny. 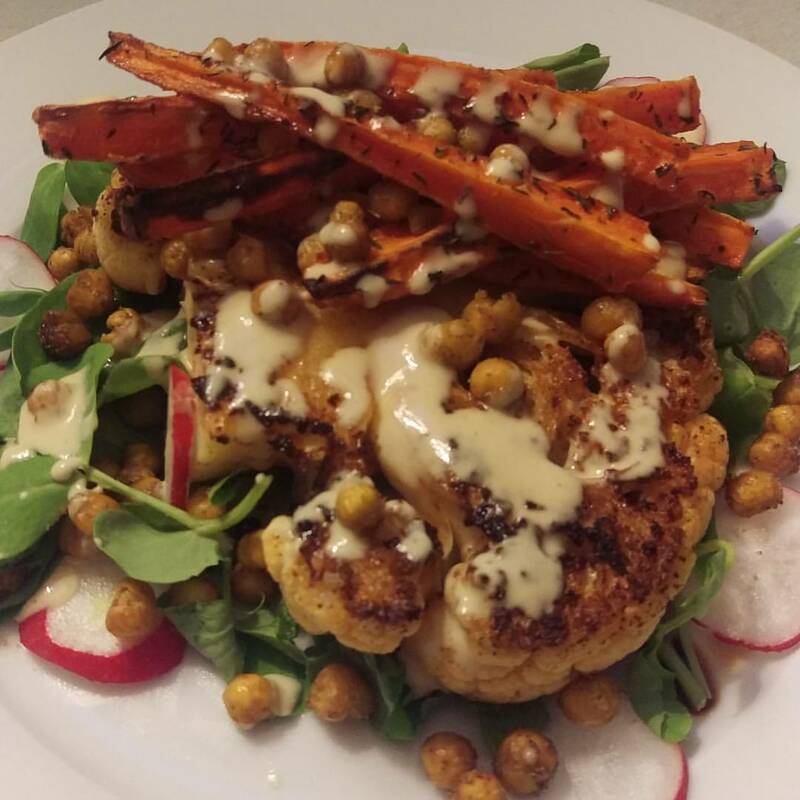 – Plate up the cauliflower steak, stack the carrots and chickpeas on top then drizzle with tahini dressing. Looks delish – definitely got a craving for cauliflower now!